Gosh, you've made me love this author's work and I haven't even ready any yet! Thank you for sharing your thoughts on this book, Lindsey, I'm now keen to discover Lauren Beukes myself - I've noted down the name. Any recommendation on a particular book to start with? Or just go in order of works? I've only read The Shining Girls and Broken Monsters, but I would say you could start with either one! Some waiting...but not as much as it would have if it was still languishing on your tbr list. I can't wait to hear what you think! This book has been looming on the top shelf of our mystery section, looking down on me while I work at the counter. You make the book sound really good, but as with most books we keep in the mystery section, this one is probably too intense for me. I enjoyed reading your review, though! 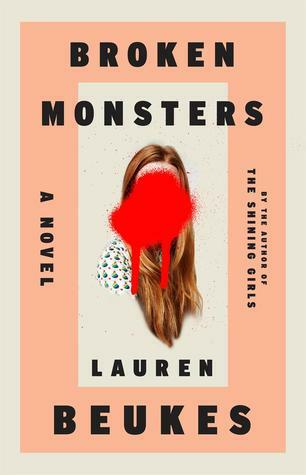 I don't read a lot of mysteries or horror, but I think I will make an exception for Lauren Beukes. Her books make me think about so much more than things that go bump in the night! I meant to read The Shining Girls when it came out, but could never get a copy...and then, of course, I forgot about it. Did you like that one? This sounds like a good mystery/thriller. And a great R.I.P. book! I did like that one too! You can read my review if you look under "All the Books." I think either of them would be perfect for this time of year and R.I.P. Very thoughtful review, thank you. I am intrigued, but think it might be a bit disturbing for me . . . especially after I saw those rejected cover designs! Thanks Leila. Disturbing is a good word for this story! I DNF'd it due to graphic violence. I just wimped out, though I'm sure it was very well-written and glad you enjoyed it! I can understand that. There are certainly some creepy things in this book! This sounds very well done! I think it sounds too gory for me, but it sounds like it's very thought-provoking, not just gory. I think that's why I like her writing so much. It's scary but it also makes you think about so many things!